A study conducted at a university in Sweden is shedding more light on the phenomena of contagious yawning between humans and their canine companions. One study noted that half of the dogs appeared noticeably calmer after catching yawns from their owner. Previous research on the effect of human yawns on animals revealed that there could be a link between contagious yawning and empathy, an important development in the study of non-human animals as empathy is usually considered a strictly human emotion. A 2008 study out of Birkbeck, University of London looked at the yawning habits of 29 dogs, including a Greyhound, a Staffordshire Bull Terrier, and a Dalmatian. Researcher and psychologist Ramiro Joly-Mascheroni initially got the idea for the study when he tested the link between contagious yawning and empathy on his own dog, a Labrador Retriever. Whenever Joly-Mascheroni yawned, his dog immediately followed suit. Fascinated, the psychologist decided to do the same test using his friends and their dogs, getting similar results. 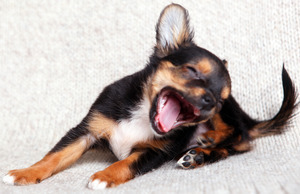 He also found that dogs were much more likely to yawn after their owners’ yawns than after the yawns of a stranger. In his official study, Joly-Mascheroni found that 72 percent of pet dogs yawned after their humans yawned — compare that to only 45 to 65 percent in studies conducted using human-human yawning scenarios. Though subsequent attempts to replicate this study failed, Joly-Mascheroni thinks his findings nevertheless demonstrate humans and their dogs communicate in many ways that we do not yet understand. “It would be interesting to find out what other information we transfer to dogs or to any other animals that we are not aware of,” he said in a LiveScience interview. Lund University researchers Elaine Alenkaer Madsen and Thomas Persson wanted to delve further into the human-canine contagious yawning conundrum in their 2012 study, which has been published in the current issue of the journal Animal Cognition. They hoped to discover whether or not dogs are expressing empathy when they “catch” yawns from their human owners. Madsen and Persson used 35 pet dogs in their study, with ages ranging from 4 to 14 months old. Because humans also develop empathy over time and in childhood, Madsen and Persson chose to look at puppies in their research. Each puppy was put through two experiments. In the first, each pup engaged in quiet playtime with their owner for five minutes. During this stage of quiet play, each owner was instructed to mimic yawns, giving the open-mouthed facial expression without inhaling, exhaling, or making any noise. Several moments later, each owner was then instructed to fake a more convincing yawn. This same scenario was repeated the following day with a researcher taking the place of each pup’s owner to gauge whether or not familiarity with the human made any impact on the frequency of contagious yawns in the dogs. The results of the study showed that, in all, 69 percent of the dogs yawned in response to human yawns, results that would suggest the legitimacy of Ramiro Joly-Mascheroni’s 2008 study. The Madsen and Persson 2012 study revealed some interesting insights into the prevalence of contagious yawning in different dog ages. The pups younger than 7-months-old displayed the least amount of contagious yawning, yawning less frequently and with more delay. Also interesting was that about half of the dogs in the study appeared noticeably calmer after catching yawns from their owner. While this new study does not definitively say whether or not contagious yawning in dogs is a behavior rooted in empathy, it certainly opens the doors for future studies into the everyday interactions between humans and canines.